There may never be a better time to be a manufacturer or private-label brand. As recently as 10 years ago, if you created your own brand of products, you likely sold them through a multi-level distribution channel. Once you achieved a high enough sales volume, you may have been able to negotiate deals directly with global retailers. Your investments in your brand were typically in collateral, print or other forms of traditional media advertising, and public relations. The real selling and merchandising typically rested with your reseller channels. What a difference ecommerce has made. Today’s brand manufacturers may still sell through traditional channels. But they also have many other sales and marketing channels available. Most are very low risk and require limited investment. Customers are now accustomed to shopping online. They do extensive research, visit many different websites, comparison shop, check on what friends are buying, and look at a wide variety of products before making buying decisions. As a result, we are seeing a high growth in so-called lifestyle brands that appeal to high-income buyers. Instead of simply buying a functional bag, water bottle, or pair of socks, buyers increasingly seek specialized, premium products. Well-conceived brands appeal to those buyers by associating their products with a particular lifestyle – outdoorsy, rugged, athletic, fashionable. These niche products tend to have more limited distribution and a more customized appeal. As a result, there is a resurgence of “Made in the USA” manufacturing startups that target the lifestyle market with niche products. If you manufacture your own products or have the ability to private label goods, take advantage of the tremendous growth opportunities available in various ecommerce channels to reach those lifestyle buyers. And when product manufacturers need to raise capital, crowdfunding sites like Indiegogo and Kickstarter offer innovative ways to fund growth. If you manufacture a product, you can raise money on many different crowdfunding sites, where participants make a donation, not an investment or a purchase. There is a risk they will not receive their expected “reward,” which in most cases is the products the company makes. With any crowdfunding campaign, you explain your product offering, your planned use of funds, and your rewards for contributing to the campaign. Here are two examples of successful recent campaigns. Xoab is a startup U.S.-based manufacturer of high-end socks. Its Kickstarter campaign raised far more than its target goal of $50,000 to fund the purchase of dyed yarn and to expand product offerings. Xoab’s campaign is well organized and presented, resulting in a successful fundraising effort. Thompson Tee, a specialized clothing manufacturer, raised more than $25,000 with an Indigogo campaign a few months ago. It is using the funds to expand its product line to include black tee shirts. I’ll expand on Thompson Tee later in this article. There are many similar crowdfunding success stories. You do not have be a startup company to use these sites. This innovative means of funding reduces the need to seek expensive capital from outside investors that dilute your own equity stake. Your own online store. Launching your own ecommerce site is a good place to start and continue to grow revenue. You will likely have high margins, direct communications with your customers, and the ability to tightly manage your brand and messaging. Many manufacturers grow so quickly, they tend to ignore other channels. Others make a strategic decision to control their own channel. Red Oxx is a manufacturer of rugged luggage located in Montana that is highly successful. Its credo is “Not sold at a store near you.” It operates a single factory store and an ecommerce site, which is rapidly moving up on the Internet Retailer 500 list. Henkaa is a Canada-based manufacturer of convertible dresses for bridesmaids and formal occasions. Similar to Red Oxx, it has a highly successful ecommerce operation as well as a local factory store. By controlling these channels, Henkaa gains a deep understanding of its customers and their needs. Every brand manufacturer should operate its own online store. If you compete with your reseller channels, so be it. The big brands are all doing it. You don’t have to undercut your resellers in price. You have the option of selling exclusive products in your online store, which is also a good place to test new products, sell lower-margin products, and move excess inventory. Marketplaces. If you control your brand, consider selling on marketplaces, including Amazon. As a small brand, you will reach a very limited market by relying on your own ecommerce site. Selling on mass-market sites like Sears, Rakuten, and Amazon will expose your products to a much larger audience. There are also specialized marketplaces like Zazzle.com that are well suited for niche and custom manufactured products. To reach global markets, consider marketplaces. If you use Fulfillment by Amazon in other countries, you will eliminate the worry about expensive overseas shipping, VAT taxes, and other customs issues. This is a fast path to global expansion for many manufacturers. Admittedly, some products may not fit mass-market sites. But even high-income, lifestyle buyers also shop there. You may pull in a whole new set of buyers. Worried about diminishing the value of your brand? It’s possible, but unlikely given the variety of products being sold through marketplaces today. Online hybrids. There are some significant newer pure-play online retailers that I classify as “hybrids.” They have marketplace characteristics, social-shopping features, and traditional reseller tendencies — with a little affiliate marketing thrown in. These hybrids include Fancy.com, Fab.com, and Wanelo.com. You can set up your own “store” within Fancy.com and Wanelo.com. You can run your own “sale” in Fab.com. All three appeal to lifestyle and fashion-oriented buyers. Fancy.com features more small brands than the others. Most manufacturers should consider a true multichannel strategy. I’ve recently spoken with several small startup entrepreneurs that are growing multiple channels simultaneously. 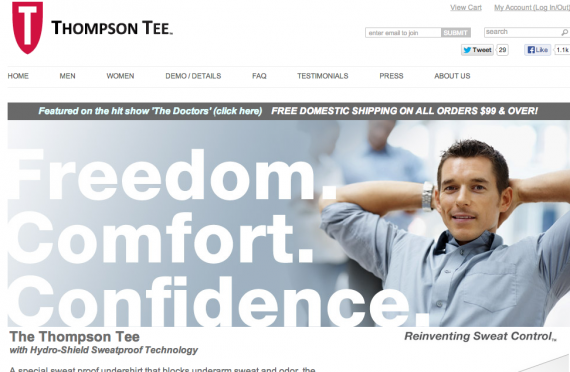 Thompson Tee sells sweat-proof tee shirts to the small segment of consumers that sweats profusely. It operates a highly successful online store, sells in marketplaces, and pursues a big-box retailer strategy. 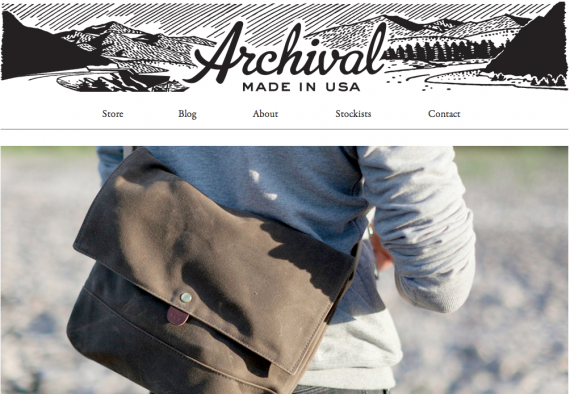 Archival Clothing is a U.S.-based manufacturer of bags and clothing that are extremely well made and rugged. It sells through traditional niche retailers and also pursues growth in other channels. Much has been written about how brands are using various social media and digital marketing channels. Here’s a quick review. Social media. Facebook, Twitter, Pinterest, Instagram, Flicker, and others can deliver your brand message and communicate with customers and prospects. Email marketing delivers messaging and make promotional offers. Search marketing reaches new audiences for your products. Comparison shopping engines also reaches new audiences. Remarketing targets shoppers who have visited your online store. Affiliate marketing reaches target markets through content networks. The benefit of these marketing channels for smaller manufacturers is that you can make targeted investments, test your results, and either exit quickly or scale up based without breaking the bank. Make a staged plan and try them all. As a brand manufacturer, you control your product mix, pricing, branding, and channel decisions. This allows you to potentially sell at higher margins and experiment much more with different channel mixes.